Consider yourself invited to the Kentwood Players production of Oliver! One of the most beloved British musicals which won several Tony Awards on Broadway, Oliver! vividly brings to life Dickens’ timeless characters with its ever-popular story of the boy who asked for more. After running away from the orphanage run by the heartless Mr. Bumble, Oliver meets the Artful Dodger and is recruited to pick pockets for Fagin. There, Oliver finds a friend in Nancy, but neither she nor the boy are fit for a life of crime. 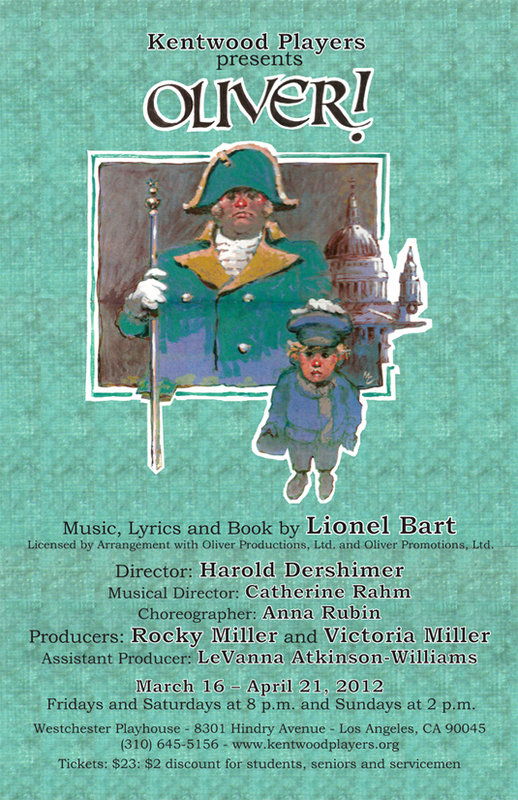 The sensational score is full of Lionel Bart’s irresistible songs including “Food Glorious Food,” “Consider Yourself,” “You’ve Got to Pick-a-Pocket or Two,” “I’d Do Anything,” “Oom Pah Pah,” “As Long As He Needs Me” and many more. Nancy and Dodger entertain Fagin and his boys, while Bill Sykes looks on with villainous envy. Nancy listens in as Fagin and Sykes plot to get Oliver back to their lair. Sykes warns the orphans to keep quiet about the location of their hideaway. Dodger asks Oliver to consider himself part of the family. Dodger introduces Oliver to Fagin’s boys, a band of London pickpockets.